Fry the slices of bacon in a sauté pan. Remove the bacon to drain and crumble it when it cools. Set aside. Add the green beans to the bacon skillet. Cook in the bacon grease, over medium heat, stirring often, for 3-4 minutes. Add the water and sprinkle with kosher salt and black pepper. Cover the sauté pan leaving a crack for the steam to escape. Cook over low heat for 10-15 minutes, stirring occasionally. 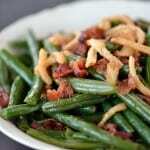 Top the green beans with bacon bits and French fried onions.